This entry was posted on October 28, 2010 by Sports Traveler. And so comes that time of year again here in Chicago when I get into my car and realize that my window has a fresh coat of frost on it and I have no idea what happened to my scraper. It's nearly November and darn it, winter is coming! When I got to the office this morning I started reviewing the Masters video that we just completed here at Sports Traveler. And ahhhhh, Augusta National. Just saying those words brings a smile to my face. It's so green, beautiful, with the manicured fairways, and the great golf! Remembering my days that I've spent walking that course just makes me feel happy. It's a special place to me. My first trip there I was supposed to go out on the course for 2 hours and come back to meet with some people. Instead I disappeared into the galleries for the entire day. I came out 9 hours later, sunburned, with a big smile on my face having witnessed some of the best golf I've ever seen in my life and also with the strongest desire to go to a driving range to try and replicate the approach shot that I saw Vijay Singh hit on 17. Everyone should see Augusta National once, but WARNING...once you go you will want to keep going back every year. 5. Amen Corner: Located between 11 and 12. I always recommend going here first because it's such a hot spot for everyone to visit and it gets pretty crowded. Visit and say your Golf Hallelujah! 4. The 1018 Club: All that walking makes you hungry and the 1018 is still my favorite hospitality venue. Great breakfast, lunch, and post round food. Plus entertainment and unlimited drinks. Shuttle service is available to/from the gate. 3. The Masters Store: You can't come all this way and not get a t-shirt. Good for bragging rights on any fairway back home. The store is packed with every type of hat, shirt, and trinket imaginable all emblazoned with The Masters logo . Go early and be prepared for lines. 2. The Lodge on Heath: For those that can't survive on Pimento sandwiches, this 2-story luxury hospitality venue is for you. Located closest to the new Gate 9 entrance, so close you can hear the cheers from the galleries while you feast on unlimited upscale food and beverages. 1. The 18th Hole: Where it's at on Sunday or any day of the tournament. Best bet for getting a seat... bring an approved Masters chair and stake out your space right when the gates open. Be prepared to have to race others from the gate to green. Run!!! Do you have a favorite Masters Memory or your own List of Masters Favorites? I'd love to hear from you. Comment on my blog! 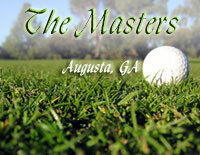 Start Planning Your Trip to The Masters!